Pharma TREN H100 (Trenbolone Hexahydrobenzylcarbonate) It has a powerful anabolic and androgenic effect. Gives an increase in very high-quality muscle mass, significantly improves the strength and endurance of an athlete. When used, it allows you to quickly work out a wonderful relief and burn fat. The work of the Pharma TREN H 100 is especially noticeable in the athlete’s appearance, thanks to him the muscles look full, hard and with sharp outlines, and the veins become more pronounced. Because of its peculiarity, this drug does not aromatize, which in turn does not lead to any water retention, and there is no risk of gynecomastia. The dosage of Pharma TREN H100 ranges from 100-300mg, which is administered as a single injection per week for 6-8 weeks. Often, with proper nutrition and effective training, it allows you to gain about 6-8 kg of very high-quality muscle mass, which after the course is almost complete, and, at the same time, makes it possible to burn excess fat well. Pharma TREN H 100mg is a universal preparation that can be combined with almost any other steroids, depending on the goals and objectives. As a rule, usually used by advanced athletes. 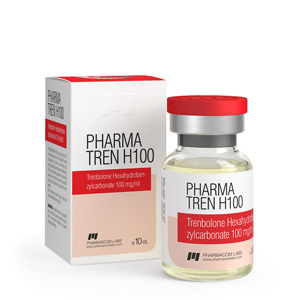 Side effects of Pharma TREN H100 can occur with excessive dosages and long-term use, and manifest as increased pressure, acne, aggressiveness, insomnia, suppression of one’s own testosterone, and a temporary decrease in libido after a course can sometimes be observed. PCT with Clomid or Nolvadex is strictly required for this drug.